Most people see the world in binary categories. They believe that there is either an inherent moral good that we must all obey, or there are no rules and life is pointless anarchy. Nihilism argues for a middle path: we lack inherent order, but are defined by our choices, which means that we must start making smarter choices by understanding the reality in which we live more than the human social reality which we have used to replace it in our minds. A work of philosophy in the continental tradition, Nihilism examines the human relationship with philosophical doubt through a series of essays designed to stimulate the ancient knowledge within us of what is right and what is real. Searching for a level of thought underneath the brain-destroying methods of politics and economics, the philosophy of nihilism approaches thought at its most basic level and highest degree of abstraction. It escapes the bias of human perspective and instructs our ability to perceive itself, unleashing a new level of critical thinking that side-steps the mental ghetto of modernity and the attendant problems of civilization decline and personal lassitude. While many rail against nihilism as the death of culture and religion, the philosophy itself encourages a consequentialist, reality-based outlook that forms the basis for moral choice. Unlike the control-oriented systems of thought that form the basis of contemporary society, nihilism reverts the crux of moral thinking to the relationship between the individual and the effects of that individual's actions in reality. From this, a new range of choice expands, including the decision to affirm religious and moral truth as superior methods of Darwinistic adaptation to the question of human survival, which necessarily includes civilization. Inspired by transcendentalist thinkers and the ancient traditions of both the West and the Far East, the philosophy of nihilism negates the false intermediate steps imposed on us by degenerated values systems. In the footsteps of philosopher Friedrich W. Nietzsche, who called for a "re-evaluation of all values," nihilism subverts linguistic and social categorical thinking in order to achieve self-discipline of the mind. As part of this pursuit, Nihilism investigates thought from writers as diverse as William S. Burroughs, Aldous Huxley, Arthur Schopenhauer and Immanuel Kant. For those who seek the truth beyond the socially-convenient explanations that humans tell one another, nihilism is a philosophy both for a new age and for all time. This book is not for everyone. It will break your mind down, and you'll have to be resilient. On the other side of the book, you'll come out as a refreshed soul. A must read for every politically inclined person. 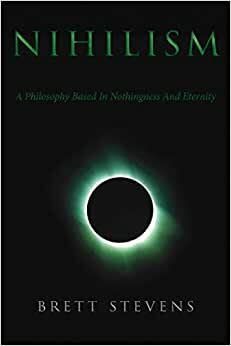 Brett Stevens’ "Nihilism: A Philosophy Based In Nothingness And Eternity" serves as both an attempt to clarify a long misunderstood term — nihilism — while also critiquing the caricature of nihilists as fatalists. Further, Stevens attempts to reinvigorate the realism-idealism debate with novel insights into the meaning of both terms. What follows is not simply a generic Amazon.com review, but rather a critical analysis of Stevens’ arguments…so if you’re ready to take the plunge, read on. "Nihilism: A Philosophy Based In Nothingness And Eternity" is a collection of Stevens’ essays that are divided up into three chapters: Nihilism, Realism, and Transcendentalism. Each chapter features a collection of essays, not any chronological order, that relate to the overall theme of the chapter. Before we get into the nitty-gritty analysis, I would like to note a few things. First, and most importantly, is that I came at "Nihilism" from a stricter philosophical standpoint than I believe Stevens intended for readers to. More specifically, being trained as a philosopher I look for specific, nuanced, and in-depth arguments to support a point. Stevens, however, takes a slightly different approach arguing that pragmatism tends to trump theory when he says “the pragmatic effects of nihilist belief are more important than detailed philosophical ‘proofs'"(54). As such, I tend to agree with about 50% of what Stevens says while finding other parts lacking in explication. All that is not designed to make a normative judgement, however; instead I wish to recognize my biases before going any further. Second, the fact that the essays are not presented in chronological order makes it slightly difficult to trace the evolution of Stevens’ thought and thus a lot of the same material, specifically in the first chapter, is retreaded without further expansion. In other words, essay #1 might define nihilism in a significantly more robust way than essay #3 does which, ultimately, makes tracing the changes in Stevens’ thinking difficult. Given that, this review will attempt to aggregate Stevens’ views and distill the main ideas.